Where Are You Birding This Fourth Weekend of November 2008? Has the insanity of the holiday season hit you yet? Thanksgiving hasn’t arrived yet, or at least the American version hasn’t, yet I’m already being barraged with nonsense about gifts and gatherings. Not that I’m a Scrooge — well, not too much of one — but really, can’t we all focus on what we’re cooking this week or, better yet, looking at this weekend? What will you be looking at this weekend and will you be watching birds? Comment below on the excitement you have planned! I’m long overdue for some Rochester birding so I hope to get out there. Rumor has it that Snowy Owls have been seen around Lake Ontario. Charlie will be flying into Philadelphia so look for him around the mean streets of Philly. As far as Corey goes, you can trust that he’ll be loitering around NYC parks, scanning for avian vagrants, as opposed to the human kind. I’m going to bird around Little Neck Bay to clear up a mystery. Last weekend I walked on the bike path in NYC that runs along Little Neck Bay and I saw a huge raft of 1000’s of very dark birds (brant? cormorants? scoters?) far out on the bay. I could not id them with the low power optics I had at the time. This time I’ll go when the light is better and with better binoculars. I hope the same type of bird is there and I will be able to identify them. Simply put: that’s one of the most beautiful bird photographs I’ve ever seen. Wow. I’m not likely to see any geese of any kind, but I’ll be out with Michael on the lower Santa Cruz River, checking out Mountain Plovers and raptors, and maybe finding an oddity. And I get to start planning a trip for Alison and me to the Sea of Cortez over Thanksgiving. I’ll be birding in the Trodos Mountains in Cyprus on field trip with Birdlife Cyprus. I’m curious what I’ll see, since I haven’t been birding up in the mountains here yet, and there are still a lot of winter resident species that I haven’t seen yet. That has to be the coolest bird shot I have ever seen. Sky is good too. My wife and I are going down to the Bosque del Apache NWR in NM for the Festival of the Cranes closing weekend. Continuing a family tradition that spans generations. I saw on ebird’s rare bird alert widget that an Aplomado falcon and a Sungrebe were reported there this week. Not to diminish the massive flocks of Sandhill Cranes, Snow Geese, possibly a Bald Eagle or two, and all the other winter visitors. Come on you guys, Corey pasted that Brant onto a blue sheet of paper and took that photo right 😉 Amazing capture Corey, really. And Mike, I will be birding about 12 miles south of here in Anderson River Park. As you might think, there are many species to see here as the Sacramento River runs through the park. Riparian habitat and oak woodlands to venture through also. We had a Great-horned Owl nest we watched last spring as they raised their young in the park. Site of the Christmas Bird Count on December 2oth this year. Great photo! Ill be birding somewhere in SE Kansas this weekend. Happy SWF! This gets me excited because my family is going to Bosque del Apache Wildlife Preserve this weekend to celebrate the Festival of the Cranes. There will be many bird species, but lots of geese, ducks and cranes, especially. What a GORGEOUS photo. Rick had it right, it is a breathtaking picture, so well done in every way. 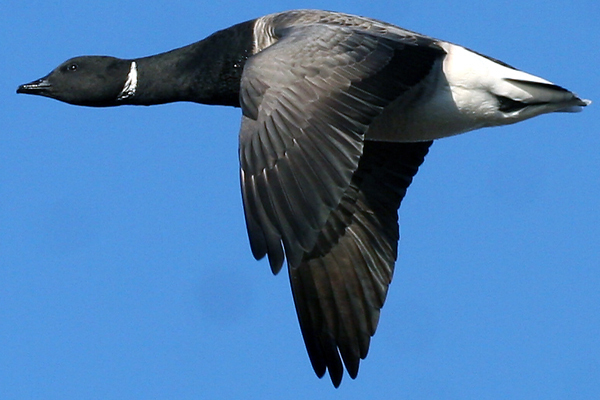 We call those Brent geese in the UK, really lovely little geese they are too! Hoping to go and see some in Dorset within the month. It’s too funny – I saw your photo and thought “the only way I’d get that is to cut a picture out and paste it on a blue sheet of paper” and then I read Larry’s comment… Must be great minds think alike! Excellent shot – can’t even begin to imagine the possibility of this in my photography future. I’ll just watch (and love) your bird shots. There’s a recently reported Pacific Loon not far from me. A bird so tempting will be impossible to resist. I just hope it sticks around till Sunday. It sounds like some of you have spectacular plans this weekend. The Festival of the Cranes has got to be spectacular and Dan, I hope to hear how the Trodos Mountains treat you. And I agree, Corey should be ashamed of how he glued that goose to a backdrop. Hi Mike, I’m also attending the Festival of the Cranes. I’ve been here since Tuesday night. No sign of the sungrebe since Tuesday; and no sign of any aplomado falcon yet this week. The number of sandhill cranes is way down – only about 5,000. I’m chalking it up to the mild temps here in New Mexico. Same thing happened last year. But, there are plenty of snow geese for everyone to ooh and ahh. Even plenty of buteos are enjoying the large number of these birds. I’ve seen quite a few harriers and a few red-tailed hawks chasing the geese in flight – a sight to behold. I will have plenty to blog about when I return. great shot, it’s fantastic very well captured! San Francisco to Ban Pet Store Bird Sales?